It’s not coffee | carpe diem! Crumbs, it has been a while. But I haven’t been idle. 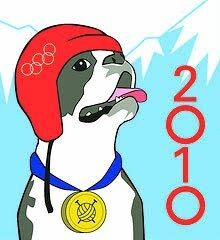 First and still foremost in my mind is the story of the 2010 Ravelympics. For those who don’t know it, the lighting of the Olympic torch at Vancouver not only marked the opportunity for athletes from across the globe to strive for gold; knitters and spinners across the globe also set off on personal journeys to try to achieve their own goals. I find a challenge like this can spark my competitive spirit to achieve far more than I might otherwise manage. 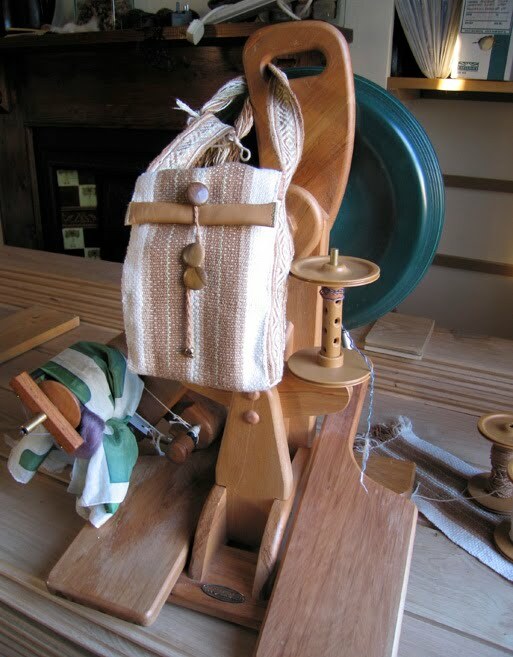 This year I set myself a goal that seemed both possible and ludicrously impossible: to spin cotton for warp and weft, weave and finish a bag inspired by Sara Lamb’s book Woven Treasures. Doesn’t seem unreasonable to you? Although I’d taken Stephenie’s Cotton class at SOAR last year, I’d never spun more than a few metres of it at any one time, I’d scarcely done any plying, I’d never spun for weaving… I’d never woven a project, I’d never used a rigid heddle loom, the Flip double heddle loom I planned to use wasn’t even in the country when I ordered it, I’d only sleyed (the term for putting all those threads through the right holes and making a warp) a warp once in my life, and that had to be cut off the loom… this was a big deal for me. The only thing I did before the Olympics began was assess the cotton stash (acala sliver and a box of naturally-coloured cotton slivers, both from Cotton Clouds), spin about 10m of acala sliver, make 2-ply and 3-ply, and solicit opinions from some weaving friends (including Sara Lamb) on Ravelry to establish which of them was most likely to be a ‘good’ weaving yarn. I did not fancy staying awake past midnight to start spinning as the torch was lit, so I began on Saturday morning, UK time. I spun and I spun and I spun. I spun in the morning and the evening. 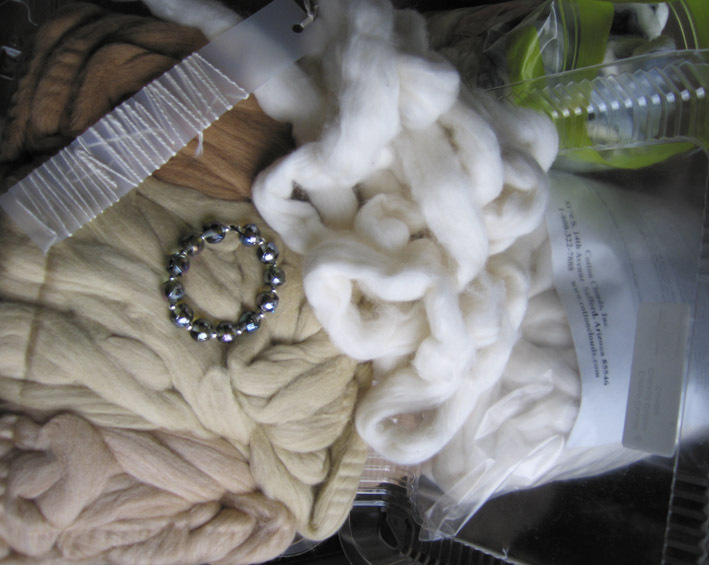 Cotton needs a lot of twist, and having read that weaving yarn needs even more, with the Suzie Pro at the highest ratio on the high-speed whorl, I treadled like mad. My husband was so impressed that he counted: when plying reasonably fast, my right foot hit the treadle twice each second, 120 rightfoots/minute. And still I had to hold the forming yarn back for a count of 7 treadles to get what looked like sufficient twist, and even after that I ran the 2-ply back through the wheel to add more twist before I warped. 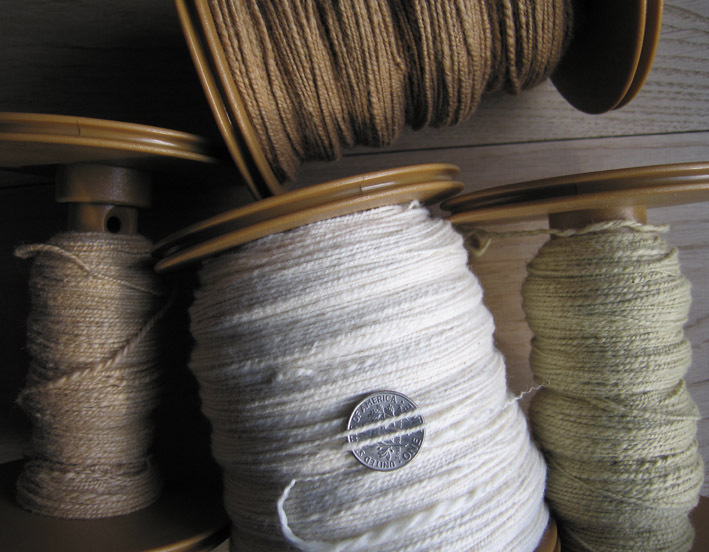 I learned that the willful, twisty singles becomes much more biddable if allowed to rest on the bobbins for at least 24 hours before plying, and the plyed yarn is happy to take more twist if it too is allowed to rest. It’s very obedient, is cotton. I like it. It’s completely different from wool/animal fibres, and incredibly satisfying to spin. The end result was an unknown quantity (but I hoped ‘enough’) of 2-ply cotton, still lively with twist, in five natural shades (those colours are not the result of dyeing: the cotton has been bred to produce them). I should have spun more of the pale brown to start with, as I ran out and had to spin more while warping the loom. After plying, warping. And at this point things went downhill faster than Amy Williams. In order to produce a warp-dominant fabric of the stiffness I desired for the bag, the 2 10-dent heddles (ie loom set up at 20 ends per inch, epi) had to be threaded 1,1,2 to get my 27 epi. I discovered that, while I find reading a lace chart to be easier than falling off a log, my brain does not do well at warping a loom. It took me three days, during which I went from thinking “I’ll just whip through this” to “Oh, no, I’ll just do it again” to “AAaaaaaaaargh” to “Wood burns. Cotton burns. I have a fire.” In the end I found the still, quiet space beyond despair, where my stubborn lives. I drew a little diagram showing how each end (length of yarn in the warp) should be threaded through the slots and holes of the 2 heddles; fortunately there was a ‘repeat’, so I didn’t have to do this for the entire 200-odd ends. And then I spent an entire day hunched over the loom, counting, hooking yarn through holes and slots, counting again. Finding an error, going back, counting again. 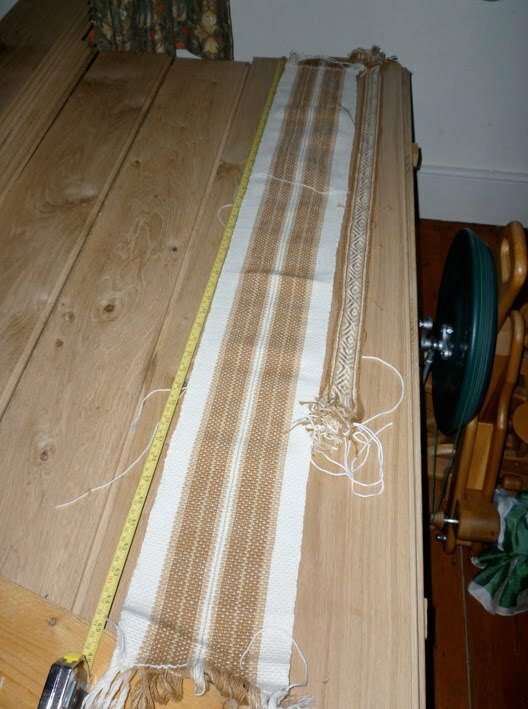 The next morning I started to weave… and found the sheds were not clearing (raising and dropping the sheds lifts and drops various warp threads, forming a gap between two ‘sheets’ of warp threads in which you place the weft thread). My one other loom-weaving project FAILed because the warp became worn and stuck to itself, so I assumed this was the problem. 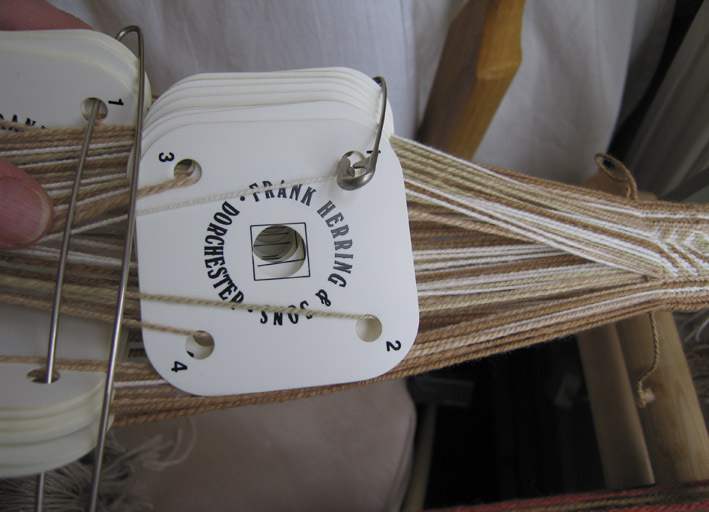 Especially as I now remembered being told about ‘dressing’ cotton warp to make it less hairy and easier to weave. So I ran downstairs, made a gelatin dressing, painted it onto the exposed portion of the warp and set the entire loom on the bathroom radiator to dry. 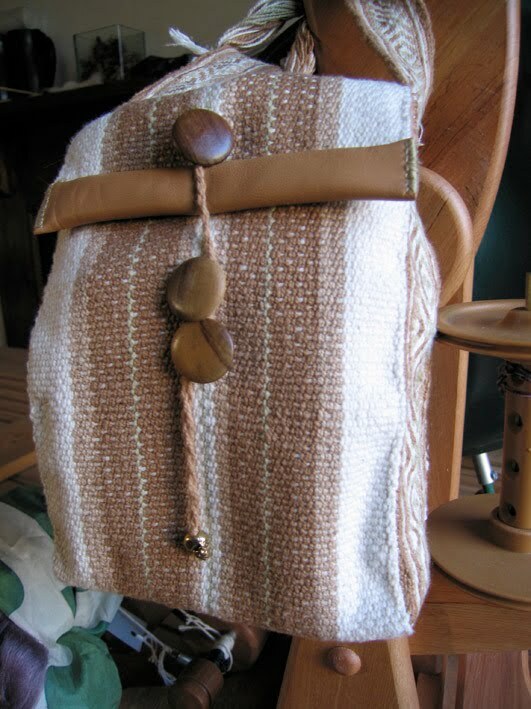 Because I couldn’t afford to waste any time, I’d already warped my TWinkle (Tablet Weaving Inkle) loom to make a tablet-woven band to form the sides and straps of the bag. I’ve done a little more TW, so was much, much happier with this… almost able to relax and watch the pretty patterns form. 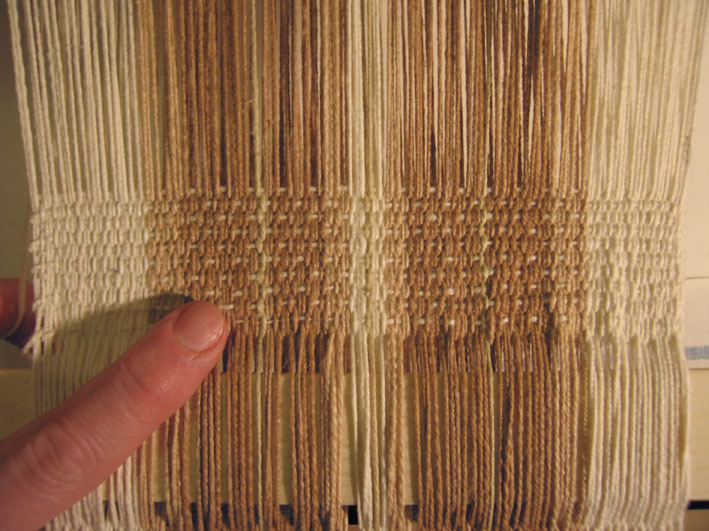 For those who’ve never heard of tablet weaving, the above shows how a set of square cards with holes in the corners creates a shed through which the weft is passed. After each pass the cards are rotated either forward or back, which changes the threads in top and bottom holes, forming the pattern on the band. began to weave, fast! And it was quite fast, once I established a rhythm. Perhaps I would finish in time after all. I cut the cloth and band from the looms, washed them in warm water, and ironed them dry. And realised I’d woven about 2′ more of the fabric than I needed. Never mind. I’d bought lining fabric to back my handwoven cotton, and now began the (for me) extremely arduous task of sewing the lining to the woven fabric. Remembering to include a strip of leather to form/strengthen the bottom of the bag, but forgetting to sew the ends of the band in. The first time. I remember thinking how much hassle it would be to disinter the sewing machine from under the yarn stash behind the chair in the front room; four hours later I was thinking I should have thought harder. At least I managed to keep the bloodstains on the brown of the band instead of hte cream, where they’d show (I am utter rubbish at sewing). A friend had given me some beautiful fine, soft leather to finish the top and flap of the bag; sewing that gave me new respect for her and anyone else who sews leather. Although apparently there are needles designed for sewing leather. Who knew? At any rate, I finished the bag with about 8 hours to spare. I could have used this time to properly finish the ends of the band/handle, but needed to actually use the bag for a while before deciding the best way to do this. So I submitted the photos to the Finish Line, and sat down with a large glass of red wine in celebration. I can keep the spare flyer, oil, allen key, wrench and other odds and ends close to hand while spinning on the Suzie. And I can admire my medal. 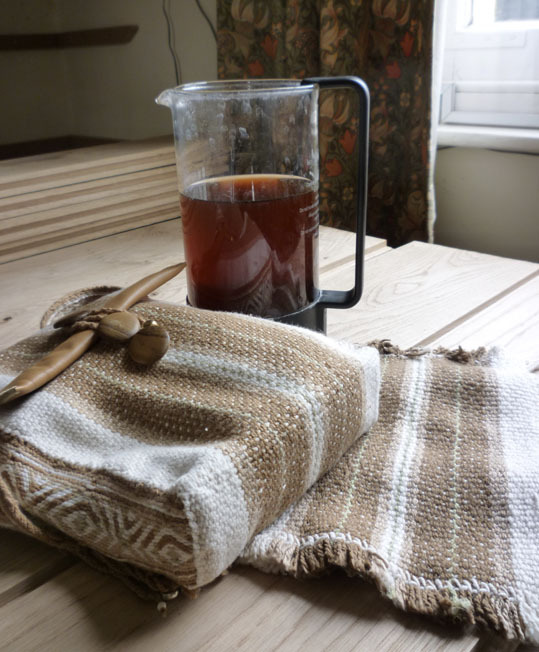 The brown liquid is not coffee, it’s the water in which the flat cloth under the bag was simmered for 30 minutes with a drop of dishwashing liquid and a tsp or so of washing soda. Which famously changes the colour of the natural cottons. You can’t clearly see it in any of these shots, but the tan/yellow-browns of the unboiled bag and band have lost the yellow tinge, becoming almost dark milk-chocolate. The most striking change is in the green, which was a pale sage green and is now a dark olive. I have to say, it’s better than a medal. I can’t describe the feeling of satisfaction or fulfillment I feel when I handle this fabric: I have made cloth. 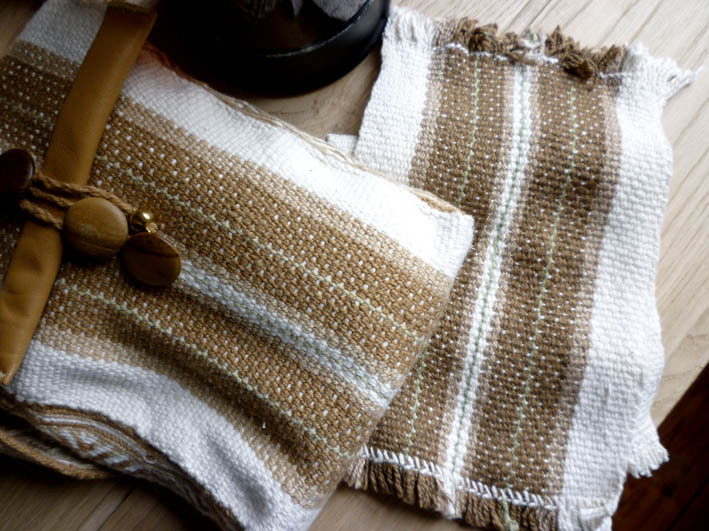 Woven cloth. If I made more of it, we would have clothing. This entry was posted in Uncategorized on March 9, 2010 by sarahw. It makes sails look even more impressive. More impressive than bags even. Thank you for the before and after boiling shots, I've never spun cotton only flax and I didn't bother with before and after photos on that. Wow. Wow for all of it. Now I want to spin that cotton from Stephenie's class and boil it to see the changes. I could use a cotton lunch bag, too…. I am so incredibly impressed with what you did. The quiet place beyond despair indeed. She spins. She knits. She weaves. What beautiful work! Absolutely fabulous! I haven't picked up cotton since Stephenie's class so I am absolutely in awe. Congratulations! You deserve the PLATINUM medal! Wow. You deserve 3 or 4 medals. That is gorgeous work and all done in an amazingly short timeframe. Very impressed! oh my, you are so talented Sarah! 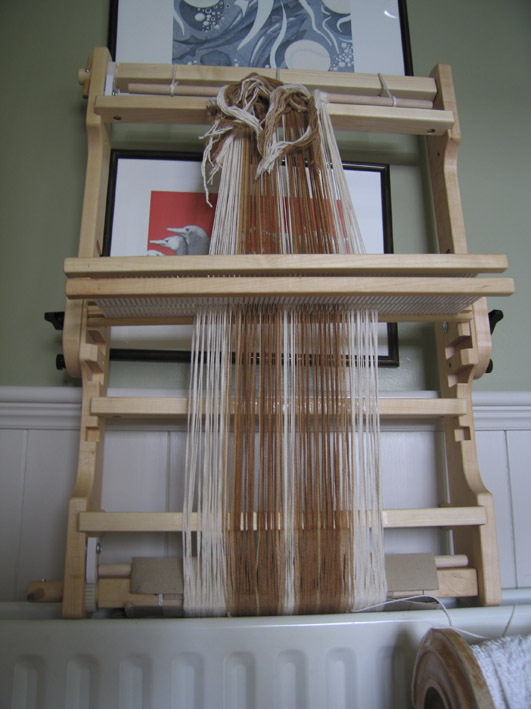 Do you give lessons on the Inkle Loom at all? I have one but never used it…. Staggeringly well done. You make me want a loom. I refuse to get interested in weaving BUT ~ oh my. What an amazing achievement. I love your description of the glee you felt having whipped that cotton into submission. And the before and after pics. Well done on that well deserved rav gold medal!